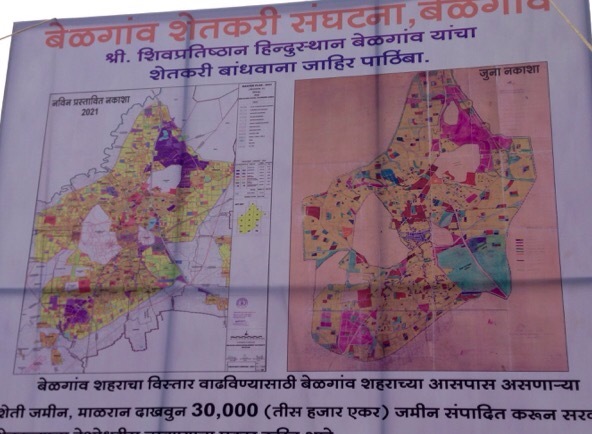 Land use of farm land in Belagavi and other 23 surrounding villages has been changed in the Master plan 2021. After the land use has been changed the said land can be converted into NA and then industries houses can be built. As far as 30,000 acres of fertile land on which multiple crops are yielded are in danger as after 2021 the land use which until now was reserved as GREEN belt, for farming/agriculture will cease to exist. The protesting farmers demanded that this zone be kept as the green zone and also demanded setting up of a Special agromonic zone on the grounds of SEZ’s, good price for the crop. The protest rally began from the BUDA office and then culminated at the Suvarna Soudha. Most of the famous Belgaum basmati rice is grown in this belt and if and when the land use is changed the existence of this type of rice would be gone, farmers said.